Smooth playability with sinister sound at an affordable price. 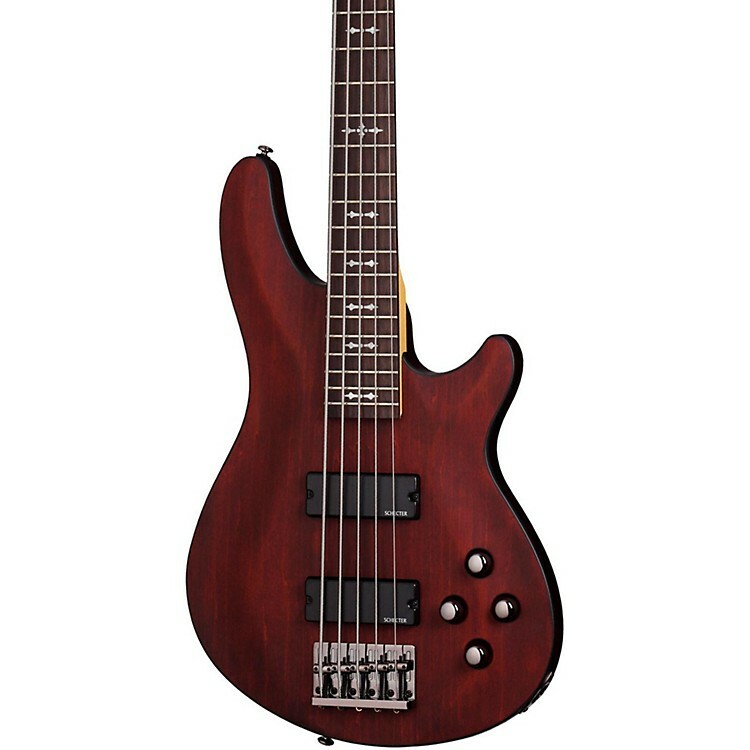 The Omen-5 electric bass guitar is the perfect bass for beginners to intermediate players. Quality woods and great sounding electronics give this bad boy a fully-loaded arsenal for the sonic onslaught that awaits. Rosewood is naturally oily and works well for any surface that sees frequent human contact, which is why it is used on the Omen-5 fingerboard. The sound is richer in fundamental than Maple because the stray overtones are absorbed into the oily pores. The Omen-5 has smooth playable maple neck. Maple has a uniform grain, it's strong and stable, and it has less reaction from environmental changes than other hardwoods. Its tone is highly reflective, and focuses more energy onto the body wood. Maple transfers a bright tone to the body that complements the warm tones of a mahogany body. The Omen-5 comes well-equipped with Schecter diamond plus pickups. Over wound coils with a ceramic magnet give these aggressive high output pickups the push that will send your amp over the edge. Made for crunchy rhythms and blistering leads, they're also perfect for drop tunings. This pickup will cut through the mix with ease. You'll get a sparkling single coil tone when the push-pull knob is pulled up. The Omen-5 comes with high quality tuners featuring a classic design in a lubricated and sealed housing to protect gears for a lifetime of maintenance free playability. Details include a 15:1 gear ratio for smooth and precise tuning, removable knobs, threaded hex peghead bushing, and a 10mm diameter peg hole. It's a sign. The end is near so get it today!